World Toilet Day, celebrated every year on November 19, is an international day of action "that aims to break the taboo around toilets and draw attention to the global sanitation challenge." Today, 2.5 billion people do not have access to clean water and a safe toilet. To honor 2013's World Toilet Day, here are photos posted by Reuters of the world's only "toilet theme park" located 19 miles south of the capital city of Seoul in Suwon, South Korea. There is even a souvenir shop! The museum opened in 2012. It is located in the home of the former mayor, Sim Jae-Duck, who was born in his grandmother's toilet. Today, Jae-Duck lives in a toilet shaped house and has "made it his life's work to advocate for clean, efficient, and working sanitation for more than 2 billion people living without toilets worldwide." His house is a 4,520-square-foot steel, concrete, and glass structure that cost $1.1 million to build. At it's center is a glass walled bathroom that occupants can turn opaque at the touch of a button. 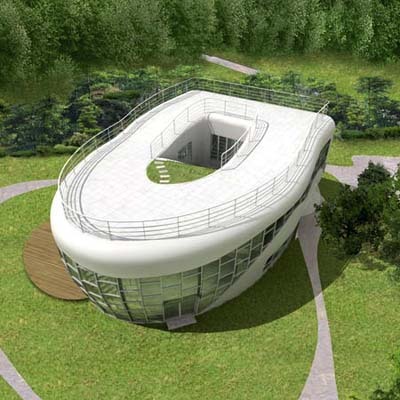 The home also has a roof-top balcony reached only by a "toilet drain" staircase. A man walks past a mural as he uses his phone at the Toilet Culture Park in Suwon, about 46 km (29 miles) south of Seoul, November 22, 2012. The park, which is the only one of its type in the world, exhibits a variety of bowls from Korean traditional squat toilets to western bedpans. A couple takes a break on chamber pots at the Toilet Culture Park in Suwon, about 46 km (29 miles) south of Seoul November 23, 2012. Kindergarten children look at a statue of a man responding to the call of nature at the Toilet Culture Park in Suwon, about 46 km (29 miles) south of Seoul, November 22, 2012. Kindergarten children walk past an installation shaped like Auguste Rodin's "The thinker" sat on a toilet at the Toilet Culture Park in Suwon, about 46 km (29 miles) south of Seoul, November 22, 2012. A visitor poses for a photo by his friend (not seen), at the Toilet Culture Park in Suwon, about 46 km (29 miles) south of Seoul November 23, 2012. A tourist poses for photos by his friend (not seen) next to an installation shaped like Auguste Rodin's sculpture "The Thinker" on a toilet, at the Toilet Culture Park in Suwon, about 46 km (29 miles) south of Seoul November 22, 2012. Kindergarten children look at a statue of a Korean boy responding to the call of nature at the Toilet Culture Park in Suwon, about 46 km (29 miles) south of Seoul, November 22, 2012. Kindergarten children play at the Toilet Culture Park in Suwon, about 46 km (29 miles) south of Seoul, November 22, 2012. A tourist talks on his phone while looking at a statue of a Korean boy defecating, at the Toilet Culture Park in Suwon, about 46 km (29 miles) south of Seoul November 23, 2012. Visitors prepare to take pictures next to a statue of a defecating Korean boy, at the Toilet Culture Park in Suwon, about 46 km (29 miles) south of Seoul November 23, 2012. Visitors point to a board with a pictogram of the world's toilets, at the Toilet museum in the Toilet Culture Park in Suwon, about 46 km (29 miles) south of Seoul November 23, 2012.